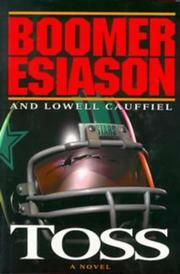 Former NFL quarterback Boomer Esiason, currently a host on ABC’s Monday Night Football, and novelist Lowell Cauffiel (Marker, 1997) team up for Esiason’s debut as a (co-)novelist. Their focus is on rising star Derek Brody and his seamy, drug-ridden new team, the New York Stars, with whom he’s just landed a $12 million contract. His big-time agent, Mike Scanlon, worries that Derek, who has a facial scar from a car accident, may not make a good impression with the press and thus jeopardize endorsement contracts with Nike and others. But Derek has greater worries than his antisocial, aggressive maladjustment: he plans to dominate the Stars (they haven’t had a winning season in seven years) and only needs to get his hands on the ball. The press is down on him at once for his utter self-confidence (he was convicted of vehicular manslaughter after letting his drunken father die in a car crash), and he mistakes the club owner’s daughter, Nicky, for a whore. His signing on has cost Glamour Boy Reggie Thompson, leading receiver in the twilight of his career, a million-buck yearly pay increase—and having Glamour Boy angry at him ain’t good. When ex-NFL player Eric Smith and a pizza delivery boy are murdered, following a visit from Derek, the new player falls under suspicion, as he does when a dead prostitute, hidden in a locker, is discovered. More than the deaths, and aside from biz deals, the richest moments here come during games and in play strategies. Heavy on the melodrama, but in its way the most brutal study of football since Peter Gent’s North Dallas Forty.